I’ll begin by sharing a promo code to receive $80 off your Sun Basket order. Get $80 off Sun Basket! This Sun Basket coupon is currently the best one offered by Sun Basket. Receive $40 off your first order, $20 off your second order, and $20 off your third order. I never thought I would be a customer of a meal kit delivery service, until the evening that I found a batch of potatoes rotting away in one of my cabinets. Maybe it was the smell, or possibly it was just the tipping point for having this change of heart. Who doesn’t hate food waste? I do, you do, we all do. Well, Sun Basket might just be the solution. In this Sun Basket review, we’re going to discuss the company, the price, showcase the ordering experience, and give you our thoughts on the product altogether. My initial review was back in 2017, but Sun Basket has changed so much since then, that I’ve decided to give this review a complete refresh in 2019. But I’m going to share some of the images from the meals back then. This was the box that you received. This is how the meat was packaged. How the meal turned out. Your meals arrive in a cardboard box that is made of recycled and virgin kraft paper. The inside of the box contains insulation, which is also made out of recycled paper. Lastly, the ice packs at the bottom of the box are composed of 98% water and 2% cotton. Here are our three meals. Each paper bag is labeled with its corresponding meal, and all the ingredients for the meal can be found in its bag – except for the meat/poultry. The number on the bottom left of the label helps you find the meal in the recipe book easier. For this review, we are going to be looking at the meal in the middle, the Mongolian Beef and Vegetable Stir-fry with Fresh Ramen. In the picture above, you can see all the ingredients that came with the meal, except for the beef, which wasn’t pictured. Take note of the recipe book that arrived with my Sun Basket order. Previously, Sun Basket used to send a recipe card for each meal, but they’ve seen moved towards sending a recipe book that contains all the meals available for that week. This is pretty handy since you’re receiving a nifty guide on other meals that you can make on our own. We are done preparing the ramen and the steak. Looks pretty delicious already! For this step, we have sliced up the broccoli, sliced the scallions, and the lime. On low fire, we are cooking the veggies in the same pan that was used for the beef. In this step, we also mixed in the Sun Basket gong bao sauce base and the chicken broth. Time to add the beef and ramen to the same pan. With just another 1-2 minutes of cooking and mixing, we are at the finish line! So we aren’t in any way professional cooks, but we were able to make a beautiful looking dish just by using Sun Basket’s ingredients and following their steps. This dish was particularly tasty! Now it’s time to explain how Sun Basket works. If you would like to get to our personal opinion on the service, then scroll all the way to the bottom. This is a company that originated in California and was started by a reward winning chef – Justine Kelly. Chef Kelly is responsible for preparing every single meal. 99% of all the produce shipped by Sun Basket is organic. When it comes to meat and poultry, they are always antibiotic and hormone-free. Even the milk, yogurt or eggs that they ship are organic. What’s also interesting is that you actually have the option to select meals composed of organic meats as well. When it comes to seafood, the seafood is always wild-caught, never farmed. Now that’s a long list! I’m also going to mention that even though “Dairy-Free” and “Soy-Free” options aren’t an actual meal plan, you can still filter meal plans on those two restrictions as well. As a reminder, when you signup, you’ll have the option to choose your meal plan, which can always be switched at any time. But I do suggest that you use this Sun Basket promo code for the best discount. Start off by clicking here to use our exclusive Sun Basket coupon and to begin the process. Once you click on that link, you’ll be redirected to Sun Basket, and from there you’ll want to click on “Activate Offer” to begin the signup process. On the “Customize” step, you’ll be asked to select the size of your order, your dietary preference, and your first delivery week. Remember, you can always change your dietary preference whenever you’d like. On this screen, it’s time to pay for your order! Using this coupon code, we were able to get 6 servings for only $31.94. On top of that, for our next two orders, we’ll receive an additional $20 off each time. But keep in mind, discount codes constantly change, so you might be seeing a different one based on how much time has passed. Since I’ve selected the “Lean & Clean” meal plan, I’m being suggested meals that are under 600 calories. Under the title of each dish, you can also find additional dietary information on that meal. For example, the Southwestern black bean and tempeh chili” is <600 calories while also being gluten-free, dairy-free, vegan, and diabetic-friendly. If there is a “Super Speedy” badge, that means the meal can be prepared within 20 minutes. Meals with a check-mark are meals that you’ve selected and would like to receive in your next delivery. With every meal, you can always see more information by simply clicking on the meal. Here is the specific meal page for the tempeh chili. For each meal, you’ll be able to find all the ingredients that arrive with the meal, the nutrition label, cooking instructions, and time to cook. If you’re looking to add a salad to your meal, that is also an option. Typically the salads have a 5 minute preparation time unless you opt to add meat/poultry to the salad. Lastly, you can also join the “Wine Club” with Sun Basket, and receive 3 bottles of wine for $59.99. 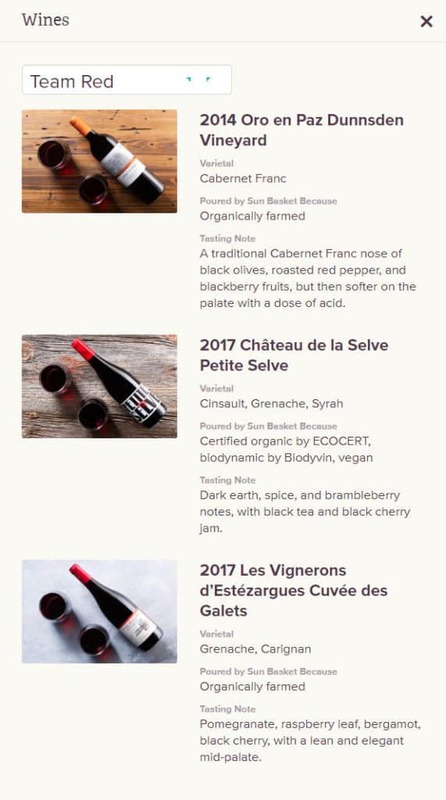 The wine options would change on a monthly basis but keep in mind that the retail price of the typical bottle would be $13-$20. 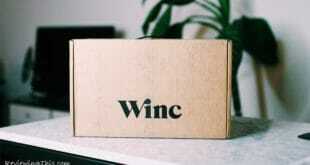 If you do elect for a monthly wine club, I would suggest taking a look at my review of Winc, you’ll be able to get more bang for your buck in terms of wine. We’ve covered quite a bit, but we haven’t discussed pricing yet, so let’s dive into it. With Sun Basket, you have two main options, the “Classic Menu” or the “Family Menu”. The difference between the two is that under the family plan, you will receive more servings for the same meal. As of 2019, Sun Basket ships to 47 states. If you live in Alaska, Hawaii or Montana, then, unfortunately, you cannot receive Sun Basket meals. But don’t lose hope, as Sun Basket secures new facilities, their delivery reach should include all the states in the US. Just last year, Sun Basket opened a new facility in New Jersey, which has allowed them to improve delivery times throughout the east coast. If you do reside in the states that Sun Basket ships to, you can head over to your “My Account” page to set your delivery days. In your “My Account” page, you have the option to change your meal plan, as well as the number of meals you receive. If you click on “View Classic Menu Pricing”, you’ll have the option between choosing 2 recipes, 3 recipes, or 4 recipes per week. If you would like to skip particular weeks, simply head over to your “Schedule” page. On this page, you will be able to view all the future deliveries, and have the option to click “Skip”, to not receive anything for that week. Keep in mind that if you do not skip a week, and do not manually select your meals, you will receive an auto-delivery, and your box will arrive with meals selected by Sun Basket. If you’d like to change the auto-selected meals, just click on “View Menu” and select other meals. If you’d like to cancel your subscription altogether, then head over to your “My Account” page, and on the bottom right, you’ll see a link for “Manage My Subscription”. Is Sun Basket Worth It? My wife and I have been a customer of Sun Basket for two years now, and we absolutely love it. I do recommend that anyone interested in ordering Sun Basket first take a look at their cookbook. This will give you a better idea of the typical meals that are available to the customers. Meals that contain meat/poultry should be cooked within 3-5 days of receiving. If you receive seafood, then make sure to cook & consume within 3 days. Sun Basket tends to underestimate the cooking times for many of their meals. My wife and I aren’t experts in the kitchen, but unless both of us are prepping the meal, it’s difficult to complete the meal within the estimated time. Sometimes an ingredient won’t be available, so Sun Basket will ship out a close replacement. This actually happened in the beef stir & ramen meal showcased in this review. We received a different type of ramen, but nonetheless, the meal still tasted great. Whenever you do receive an ingredient replacement, you’ll find a small note in your paper bag informing you. You’ll sometimes receive more of an ingredient than you need for your meal. For example, in the beef stir & ramen meal, we only had to use 3/4 of the chicken broth that we received. So make sure to find other uses for your leftover ingredients! If you are a pet lover, and would like to try out a healthy meal option for your loved one, then take a look at our NomNomNow review! Next Review: Ibanez JEMJR – is this affordable Steve Vai model any good? After reading this, and others similar to this i think that i am going for it….I pay close attention to what I put in my body and this what I have been looking for. I do not always have the time to get to the market, so this I believe is the next best thing. The next time I write on here it will be a review. That’s great to hear Dan that you’re interested in Sun Basket. As you’ve pointed out, they are a pretty awesome service and makes sense from a financial standpoint. I do hope you follow up with your own personal review. That’s good to hear Tony. What is your favorite meal so far? I have questions and they keep hanging up! Also, if you ask your questions here, I’ll also do my best to answer them. Thank you for sharing your opinion. I understand where you are coming from. I believe in this case, the reason why they market themselves as a “non-GMO” product is due to the typical negative connotation that GMO’s receive publicly. The average consumer isn’t educated on GMO’s enough to discern that there are some GMO’s that are healthy, and some that there not. Either way, thank you for your feedback! every month so I do not waste food, save money and not start gaining weight back? Sure enough! That’s a good point that you mention, I will likely update my review to show how customers are able to pause their service. 3) On this page you will see all the meals that planned for you in the future weeks. You’ll be given the option of “Change my menu”, “Skip” or “Donate”. If you do not want to receive a delivery for a specific week, all you have to do is click on “Skip”. Keep in mind that you should be able to customize your options for each week for up to 6 weeks in the future. Lastly, if you are looking for an automatic option that will only ship out once every two weeks then unfortunately I have yet to see such an option, and I’m not sure that’s available. For the time being, you’ll have to skip the weeks manually. I live in Alexandria, Virginia and I am loving my meals from Sun Basket. My only complaint is that the box is delivered on Wed night. Is there anyway to change that to either a Monday or Tuesday? As far as I know, deliveries on Wednesday are a standard practice for all customers on Sun Basket. But, if you live in California, send them an email, they might be able to move your weekly deliveries to Tuesday. Outside of California, we are all stuck with Wednesday deliveries unfortunately – hopefully with time the company will allow us to elect a different date for delivery. This is not true. I live in Maryland, and get my boxes on Monday. Try calling them! I may have an answer for you on this one. My son works in Sun Basket’s Midwest facility in Illinois Thursday through Monday with Tuesday and Wednesday being their days off. Monday is the day they pack everything for shipping and on Tuesday the delivery trucks roll out to their destinations. Sun Basket is also a great place to work– wages are well above average, excellent benefits. generous PTO policy and employees are treated with respect and appreciation by management. I would love to try it out. Just need meals bi-weekly. Is this possible? Yes, that is possible. Please take a look at the response I gave to Beverli Eagan in this comment string. All you have to do is login and “Skip” the weeks that you do not want your meals. Can customers set up an order for every other week? I am a single household and I only eat at home M-F. I waste so much expensive food because it goes bad before I can use it. I do not want to run into the same problem. Yes you may. Please check the other responses I gave in this comment section, someone else asked the same question and I gave them a walkthrough as to how it’s done. It’s quite simple. Do you need to cook all 3 meals the first 3 days or will they stay fresh enough to cook them over the whole week? 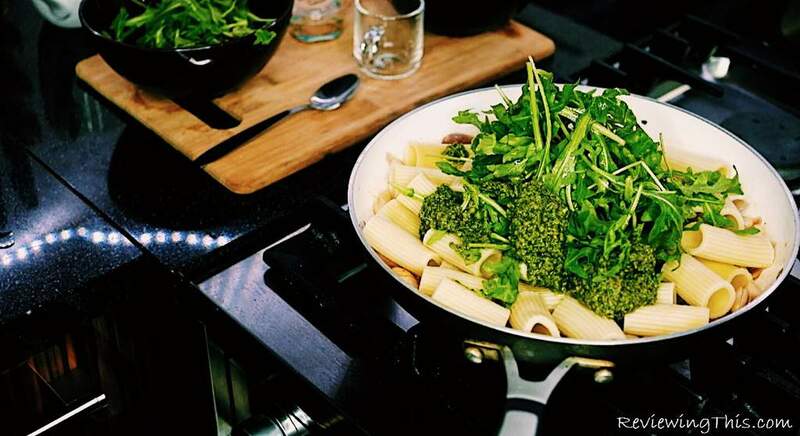 You don’t need to rush to cook all your meals. It does depend on what ingredients your meal consists of but typically you can cook each meal within 4-5 days. If your meal includes meat products, they do recommend that you cook your meal within 3 days. Can I change the order of delivery for the recipes that I’ve chosen? They seem to go in an automated order. Expect to be impressed. I’m very picky and was blown away by the quality of ingredients and recipes…..it’s cooking class made fun n simple. I’m excited to come home each Wednesday for my basket. p.s. I adhere to the policy and prepare all my meals within three days, these are the freshest ingredients you can imagine. Thanks for sharing your experience, glad to hear that it’s lived up to your expectations. Trying to send this as a gift to a friend. You’ll be able to select between a 1 week, 2 week or a 4 week gift plan. Can you tell me why they advertise 3 free meals and then make you pay $34+ to sign up?? Ashley, when you place your first order with Sun Basket, you are required to order at least 3 different recipes. Each recipe is prepared to feed two people. So when you’re placing you’re order for 3 recipes, you will be receiving 6 servings, and since you are a first time customer of Sun Basket, they will pay for 3 of those servings, while you pay for the other 3 servings. Very thorough article, although I have to disagree with you on one point. Sun Basket is not the ONLY company delivering fresh organic non-gmo meals with options such as paleo, but it is ONE of the companies doing this. Please check out Green Chef at greenchef.com. They are also fresh, organic and non-GMO meals in much the same fashion. They have different meal plan options. They do an amazing job and every meal is phenomenally delicious with generous portion sizes. You can skip weeks just like this one. You can also get a box of free meals to try. One difference I see is in the packaging. Sun Basket does appear to possibly be more eco-conscious with their packaging. Another difference is the price. It appears that Green Chef is more expensive, however this assessment is without comparing quantity and quality. to the gmo scientist lady, great that your a scientist but honestly natural healthy food should not be genetically modified plus should be preferred ORGANICALLY — organics is 33% less pesticide than GMO. I am sorry I don’t prefer non-gmo, I will wait for a company that does completely Organic. Medications are different story yes they are GMO — ahhh hello look how many side effects there are in taking one kind of medication for a sickness and then have to take other medications for the side effects. People that doesn’t realize that eating healthy and being active can prevent many, many illness they don’t have a choice but to take medications. Yes eating healthy prevents being sick but with you scientist that works for pharmaceuticals I am sorry you are all about the money including majority of the doctors out there. I am sure you as a scientist probably don’t take even eat GMOs but Organics because you know the difference in them. Stop falsifying what GMO and non-gmo can do for people. Have some dignity and tell people the real choices they have, I wonder how you sleep at night. If you join do you have the option to cancel at anytime? Yes! If after your first delivery you don’t care for Sun Basket, you’re able to cancel your account and any future charges. Thanks for the $50 coupon code, worked perfectly! I used your sun basket coupon code a few weeks ago to order three meals. I received them last week and had the chance to cook all the meals. I was pleasantly surprised by how simple it was to follow the recipes and how well the meals tasted. I’m going to recommend Sun Basket to my friends. Thanks for your review of Sun Basket. We’re glad to hear that you also had a delightful experience with them. If you do recommend Sun Basket to your friends, make sure they take use of the coupons shared in this review! Are there many gluten-free options on Sun Basket? And if so, will your promo code still work in a few weeks from now? Can’t buy right now, but will want to buy later next month. You’ll typically find 6-8 recommended gluten-free options per week. In regards to the promo code, it will still be active weeks from, thanks! You pay for a specific delivery, there is no monthly subscription. If you would like to skip specific deliveries, you may do so within your customer interface. Thank you for the coupon code! I just placed an order..I had been contemplating which one I wanted to try…Sun Basket vs. Hello Fresh, etc. then I came across your review. I am excited to receive the first shipment. Thank you so much for sharing! Much appreciated.